As a Christian business owner I designed, made and donated two custom memorial clergy stoles after the horrific, senseless shootings at Sandy Hook School, Newtown, CT and the Orlando, FL Pulse Nightclub shooting. With each stitch I prayed for the souls that were lost and the family and friends of each victim. Each of these stoles were blessed by my priest before being donated. With many tears as I created, designed and made a clergy stole in memory of the young children and their teachers who died in the Sandy Hook School shooting. The stole was created with a beautiful white on white fabric. A gold angel was embroidered on each side of the front of the stole along with the names of the twenty-six that lost their lives that horrible day. Also embroidered, from right shoulder around the neck to the left shoulder was “Blessed are those who mourn for they shall be comforted” Matthew 5:4. I donated the stole to Trinity Episcopal Church in Newtown, CT. I chose Trinity after I began the stole and saw on the evening news a story of the burial of a couple cub scouts at Trinity and because I am a lifelong Episcopalian. Ironically I now belong to Trinity Episcopal Church in Greece, NY. 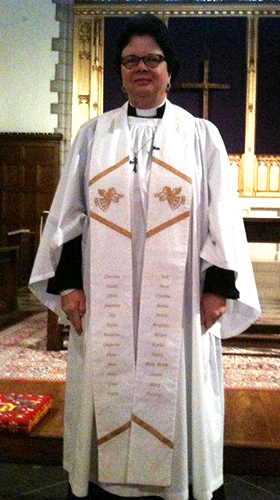 Left Picture – Rector of Trinity Episcopal Church – Newtown, CT wearing the memorial stole. Right Picture – Memorial stole showing the names of each soul lost that day, gold angels and beatitudes around the neck of stole. The stole was donated to the Episcopal Diocese of Central Florida. 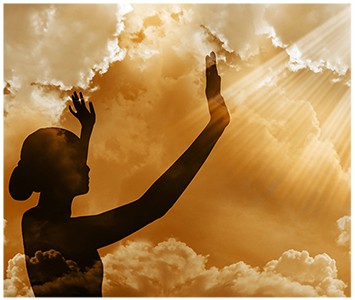 Laurie chose to give to the Episcopal Diocese because she is a life long Episcopalian. The bishop of the diocese is going to see that it gets to the proper priest or parish in Orlando. Left Picture – The stole showing the names of each soul lost that day and the two beatitudes on the front of the stole. Right Picture – Me holding the memorial stole before it was blessed at my church.